Dr. Tang received his medical degree from Norman Bethune University of Medical Sciences in 2000 and his PhD degree from Central South University in 2007. He is currently an Assistant Professor in the Division of Surgical Oncology, Department of Surgery, University of Pittsburgh. Dr. Tangâ€™s major findings on HMGB1 biology have been presented at 33 regional, national, and international meetings and in eight book chapters, as well as in 58 research and review articles published in high impact factor journals such as Gastroenterology, Nature Immunology, Autophagy, Journal of Cell Biology, Proceedings of the National Academy of Sciences, Nature Communications, Cell Metabolism, Cancer Research, Oncogene, Cell Death & Differentiation, and Clinical Cancer Research. 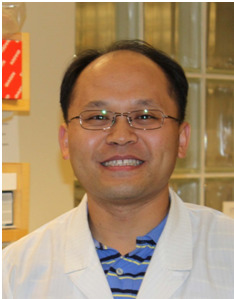 Moreover, Dr. Tang is the first and/or corresponding author on 42 papers. Regulation and function of Damage-Associated Molecular Pattern Molecules (DAMPs), e.g., high mobility group box 1 (HMGB1) and histone, in cell injury, cell death (e.g., apoptosis, necrosis, necroptosis, proptosis and ferroptosis), adaptation (e.g., autophagy), and their pathophysiological role in cancer (e.g., pancreatic cancer and leukemia) and inflammatory disease (e.g., pancreatitis and sepsis).